One strike will bring them together. 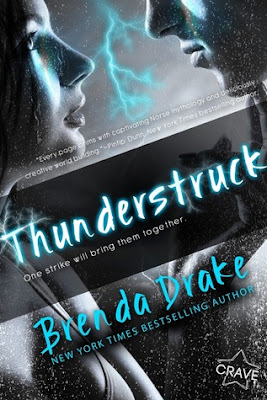 Thunderstruck is the most vibrant and intriguing book by Brenda Drake I have ever read. The plot, the storyline, the romance, everything is phenomenal. I love the world Brenda has created. Blake Foster is Thor’s son and his mission is to go to Earth and find Heimdall’s horn before it gets into the wrong hands. Stevie Moon is a closet comic book geek. When they meet Blake gets this feeling that Stevie is the key to finding Heimdall’s horn and saving his world. Stevie and Blake’s relationship is so cute. Stevie’s “I don’t like him to I like him” transformation is so funny. This is a good girl meets “bad” boy story. Sadly, there is some violence to four legged creatures so be mindful but, other than that Thunderstruck is an amazing story.